Naegele is the director of content for MeriTalk. He served as the senior executive for Defense News, managing both the organization’s US and international editions. 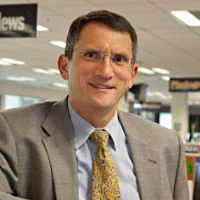 Following 25-years in defense journalism, Naegele became the Editor in Chief for all of Gannett Government Media’s products, where he led the world’s largest independent military and government newsroom, as well as four Military Times publications – Army Times, Navy Times, Air Force Times and Marine Corps Times. He was the founding editor of Marine Corps and Military & Aerospace Electronics. Naegele graduated from the University of Delaware.